Santa has to deliver as many fancy dress costumes as possible before the time runs out! Click the mouse to fire a present. 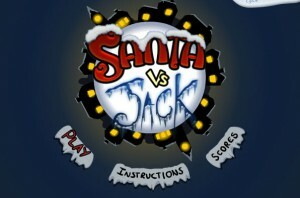 Use the arrow keys on the keyboard to move Santa. There are many obstacles which will make this task a difficult one, including dangerously tall buildings and Jack F’s savage icicle attacks. The more presents you deliver without dropping, the higher your multiplier. For each multiplier you will be given a different fancy dress custome to deliver. Get all 16 costumes for the ultimate score!